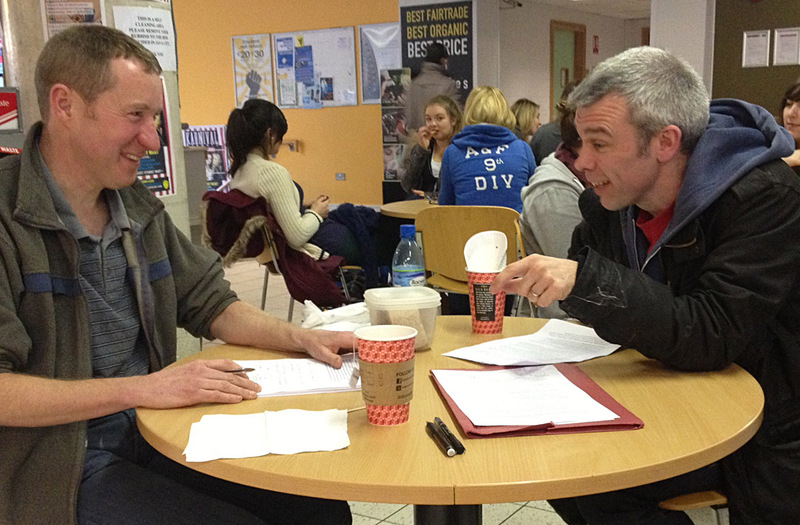 Gavin Duffy and Rob Howard discussing Gavin’s conceptual framework. We’re making definite progress on our research, Gavin and I. 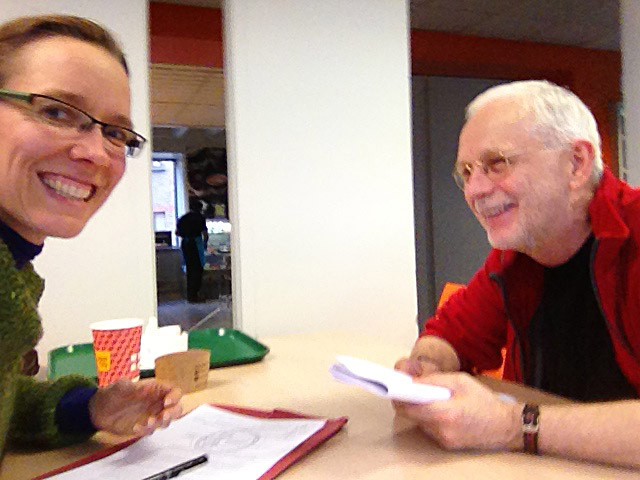 Last week’s meeting with Dr. Rob Howard was a success, I’d say. Gavin had a good “statement of purpose” to share with his dissertation advisor. During our lunch meeting, the three of us were able to produce a diagram for the study (i.e., a conceptual framework model) that I hope will help speed the writing along. It’s so inspiring to see Gavin make progress on his PhD! Kind of makes you want to write a dissertation yourself, doesn’t it? I wouldn’t mind writing another! That lucky because my current research project actually feels like a dissertation study. I’m happy to report progress on it as well. Last week I emailed the outline, theoretical models, and introduction to my supporting authors and Dean Murphy. I’m hoping to get feedback from them over lunch today. Shannon Chance and Joe Dennehy at the Scholars Cafe on Aungier Street. I’m putting the research to good use already, though. Right after the meeting with Rob Howard, I was in the faculty cafeteria at the School of Business. A very energetic professor, Joe Dennehy, bounded over to ask follow-up questions to the Teaching Fellowships keynote I delivered. Joe wants to coordinate a group like the one I’ve been studying and asked my advice. Every time I discuss the study I learn more. And fortunately my graphic models worked well for communicating core ideas to Joe. His zest for new ideas is contagious. How can you not love someone who writes of “the joyful serendipity of running into you on my way to see” the Head of School. I plan to keep the conversation going with Joe… maybe I’ll soak up some knowledge about housing economics (which he teaches) while I’m helping him coordinate his faculty learning group in the spring.